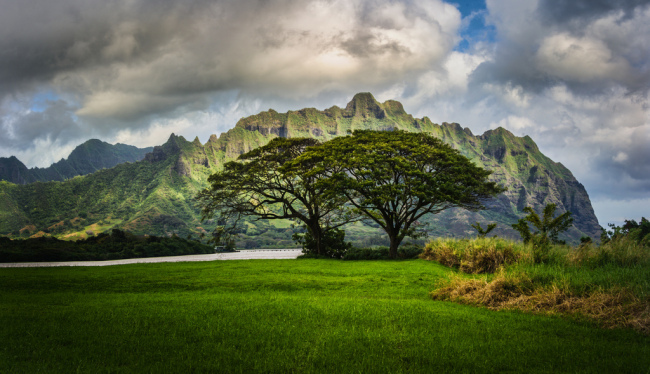 The Lost Cliffs of Oahu by Trey Ratcliff via Flickr CCL. For my father, whose own parents had taken him as a child to the depths of the Wai’anae Mountains, Oahu’s wild heart was the key that unlocked his soul, bringing him back to himself. Our hikes exploring Waimea Valley or the Hau’ula trails were times, he explained, for us to look into our hearts and see the best of ourselves reflected in the natural world. “Know yourself,” was a phrase he often quoted to me on our jaunts. Silently crossing burbling streams or making our way deeper into the Ko’olau Range, we kept our senses alert for the sounds of bark and nuts crunching beneath our feet, the quick flash of a red-crested cardinal as it dove into the branches, the whiff of delicate perfume from rose apple blossoms. Our speechless rambles were only broken with peremptory whispers as my father identified the cheerful yellow amakihi swaying on a limb, the fiery red stamens of a flowering myrtle as it quivered in the breeze, or the discovered tributary of a tiny silver runnel. My time with him was spent not on discussions about my future or his past, but on total absorption of Oahu’s natural paradise. Everything else, he claimed, was secondary. We did more than walk the trails and see the sights, however. My nature lessons began on the island and they were steeped in science, art, and religion without my ever realizing it. Alongside my father I dissected fallen calabash to examine their white flesh interiors, saw the postmodern movement in the intricately twisting boughs of the koa tree, and learned to imitate the waxbill’s call to battle. Together we examined how the long, curling stamens of the wiliwili flower added depth to its exotic beauty. While we looked down upon the fertile valley from the top of Mount Ka'ala my father pointed out how the poppy-red apapane bird was a perfect mate for the crimson ohi’a bloom. On our treks, every ground fern and creeping bindweed was studiously attended to, but it was not simply the minutiae of the forest that my father uncovered for me. Often times we would simply stand before a grove of trees or a waterfall, taking everything in without a word spoken. “Communing with nature,” was how my father’s friends would mock our periodic excursions, but he did not care. To him everything about life, including spirituality, could be investigated, admired, and worshipped in the hidden world of Oahu’s viridescent maze. I am still admiring the unspoiled reserves and mountains of this Hawaiian isle. They remain the best part of my life. As an adult I keep returning to their variegated plumage whenever I can in honor of my father. While he can no longer physically accompany me on my pilgrimages, his spirit continues to pervade the tangled depths of the island. Traveling along Oahu’s back country paths I can hear his voice mingled with the call of the thrush and I understand now that all those years spent trekking in this wilderness with him were life lessons. Spying the jewel-like delicacy of the wiliwili blossom on my hikes, I realize my father was teaching me never to overlook the insignificance of details. Watching a honeycreeper drawing nectar from the ohi’a tree I know I have learned the mutual benefits of an interconnected world. My father revealed to me the power that nature can have on the psyche of industrialized, urbanized humans. The peaceful valleys and affluent forests of Oahu are where I come back to regain my enthusiasm for life. Climbing the moss carpeted slopes I am blissfully lost not only in the transcendental exquisiteness of Oahu, but in the sweet memories of quality time spent with my father. Looking down upon Makua Valley, I hope someday when I have children, we can delight together in seeing the same blooms that my father first brought to my notice. Atreyee Gupta translates her love of history and culture into writing and publishing travel stories which explore unique journeys. Her travel philosophy is to unearth the compelling stories hidden underneath everyday objects, landmarks, and historic events. As cofounder of Bespoke Traveler, she hopes to offer experiential travelers inspiration for their next adventure.